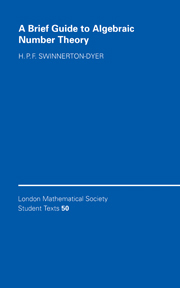 This account of Algebraic Number Theory is written primarily for beginning graduate students in pure mathematics, and encompasses everything that most such students are likely to need; others who need the material will also find it accessible. It assumes no prior knowledge of the subject, but a firm basis in the theory of field extensions at an undergraduate level is required, and an appendix covers other prerequisites. The book covers the two basic methods of approaching Algebraic Number Theory, using ideals and valuations, and includes material on the most usual kinds of algebraic number field, the functional equation of the zeta function and a substantial digression on the classical approach to Fermat's Last Theorem, as well as a comprehensive account of class field theory. Many exercises and an annotated reading list are also included. Preface; 1. Numbers and ideals; 2. Valuations; 3. Special fields; 4. Analytic methods; 5. Class field theory; Appendix; Exercises; Suggested further reading.